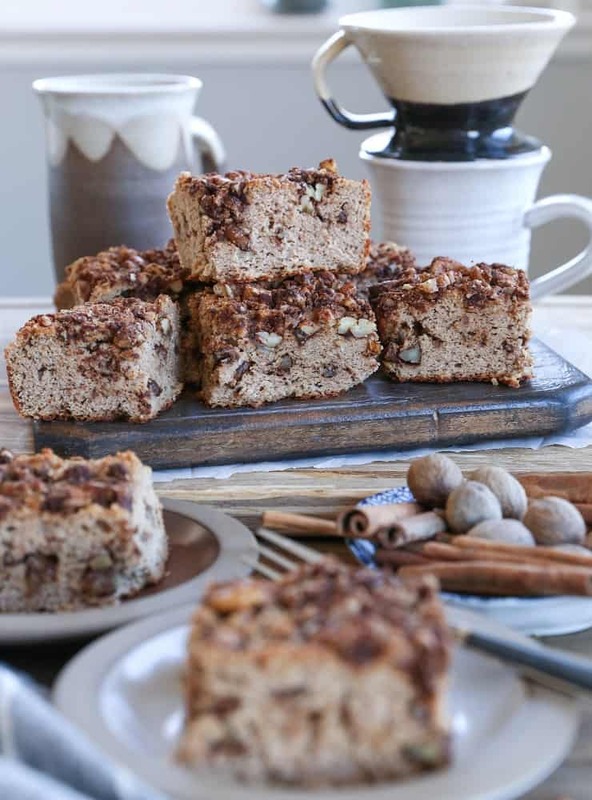 Cinnamony, fluffy, nutty, perfectly sweet chai-spiced coffee cake made with coconut flour, almond flour, and pure maple syrup for a paleo treat! Only a few days until Christmas! Have you had your fill of Christmas cookies yet? I admit, I’m holding strong, as I still have a stash in my freezer, which I couldn’t possibly just let sit there like like little rock solid hunks of burning temptation and save them for a later date. I’ve been pulling out a cookie or two each morning to enjoy with my bulletproof coffee. There’s a lot to be said for frozen cookies, if you can believe it! There’s also a lot to be said for patience and allowing your cookies to thaw, but that’s neither here nor there. I wanted to leave you with one last healthy treat before Christmas to share with your family. It’s that cake-for-breakfast situation we all know and love. 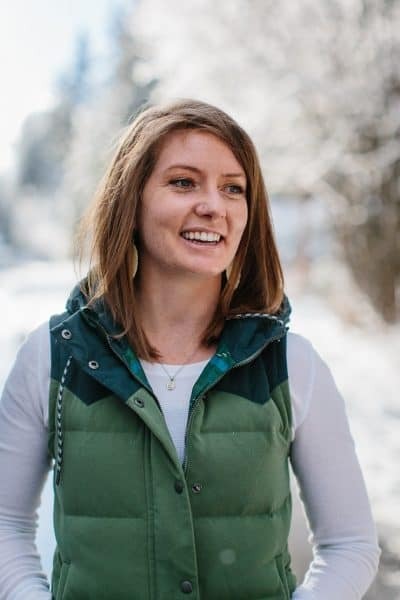 I took my classic Paleo Coffee Cake recipe, tweaked it, flipped it and reversed it, and Chai-spiced it. ..And that brings us to where we are today: discussing this super moist, flavor-packed, dense-yet-airy hunk of coffee cake luuuurv. 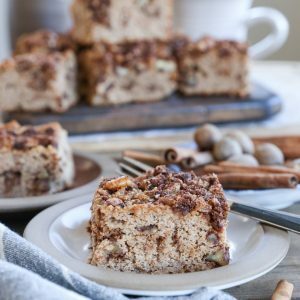 Made grain-free, refined sugar-free, and dairy-free, this is an awesome coffee cake to share over the weekend with company, or enjoy Christmas morning. It’s perfect for those who have multiple food intolerances. Hint: If you’re allergic to eggs or are vegan by choice, use this egg replacer for an awesome alternative. As is usual with my cake, bread, and pancake recipes, I prepare the cake batter in my blender, which takes literal seconds to make. 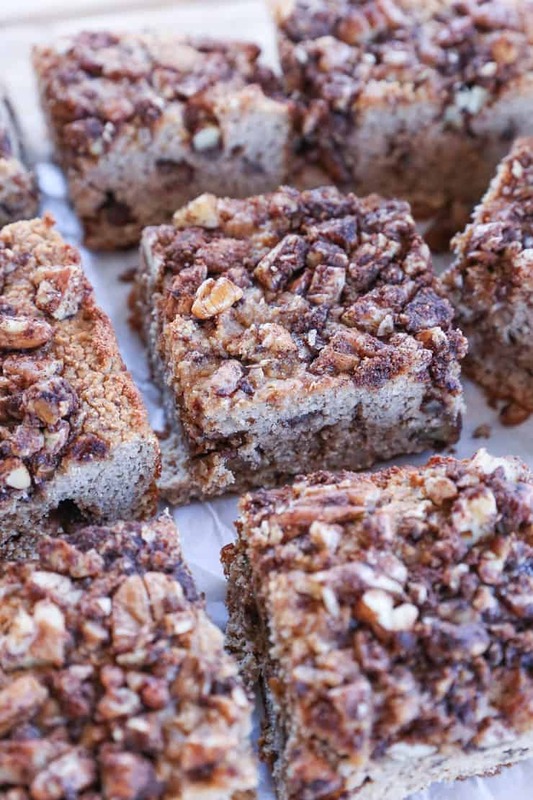 I toss together the nutty pecan topping in a bowl, pour it all into a cake pan, bake, and the rest is history! I will point out one little detail: if you have IBS and/or a sensitive digestive system like me, go easy on this coffee cake. After years of trial and error, I’ve discovered coconut flour can be a bit rough on my colon (if you catch my drift), so I consume cakes like these in very small doses (think: just enough to dunk in your coffee once or twice and call it good). 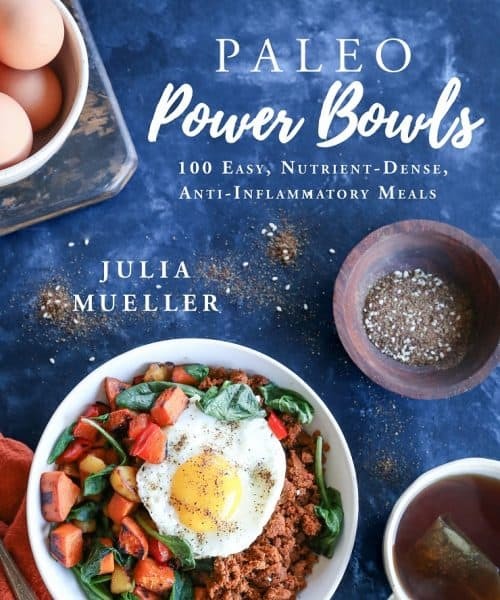 While coconut flour is not considered a high-FODMAP food, I’m convinced there’s something about it (other than the fiber, of course) that makes it gassy for us sensitive GI system folks. You should definitely make this. If not for your own good, for the sharing with others. Bake sales? Baby showers? Holiday parties? Brunches? Check, check, checkity check. 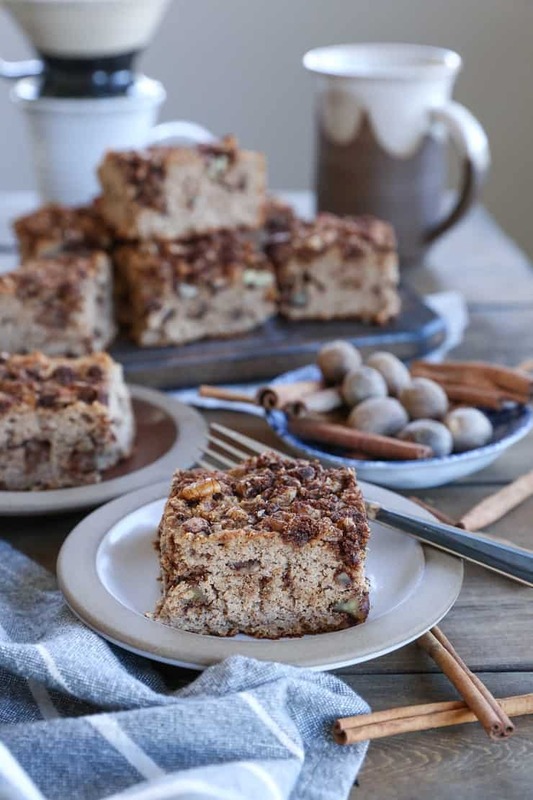 This coffee cake has A LOT of chai-ness to it! If you’re a person who prefers subtle spices, dial it back on all the spices, particularly the cloves. 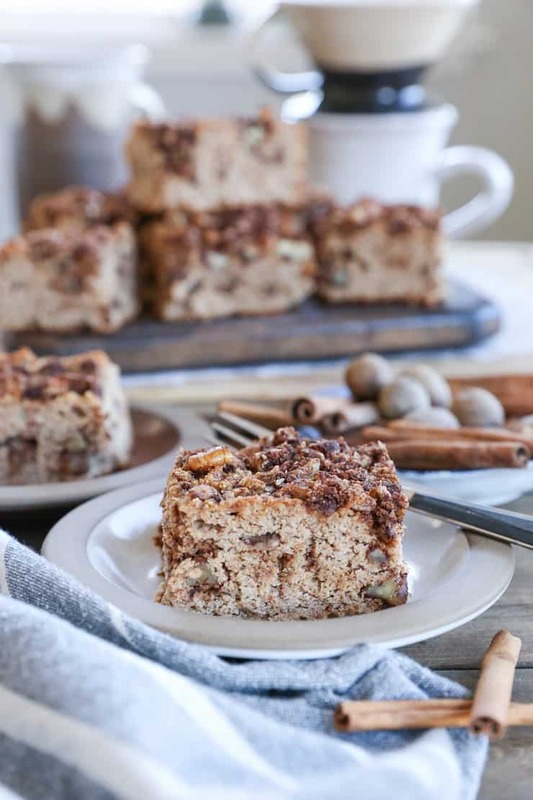 If you say BRING IT ON to all-things cinnamon and nutmeg, you’re going to adore the crap out of this cake! You’ll notice the ingredient list is puh-retty long…fear not! Most of the ingredients are spices (and there is a lot of crossover between the ingredients for the cake and the ingredients for the topping), most or all of which you probably already have. If you have a Chai Spice Blend, feel free to use it rather than measuring out the individual spices. Add the ingredients for the cake to a blender and blend until smooth. The batter will be very thick - this is normal! Stir together the ingredients for the pecan topping in a bowl. Pour half of the coffee cake batter into the prepared cake pan and spread into an even layer. Sprinkle half of the pecan topping over the cake batter. Repeat for the remaining cake batter and pecan topping. Bake on the center rack of the oven 30 to 35 minutes until the center feels firm when poked. Turn off the oven and leave the coffee cake in the still-hot oven for 5 to 8 minutes. Remove from the oven and allow it to cool 30 minutes before slicing and serving. I absolutely love your flavor choice here. The coffee cake just sounds amazing. It seems like a perfect balance where it would be sweet but no too sweet. I made this coffee cake this morning. W-O-W! I’m in heaven. I did make a few modifications based on your notes like using full fat greek yogurt & dialing it down a bit on a few of the spices. I also substituted the coconut oil in the cake for grass-fed butter. I’ve made many of your recipes and they never disappoint. Thank you for all the amazing recipes you post!! This days im doing diet, Do you think this cake will affect on my diet? How many calories this cake contain?